This is an awesome 6.3 oz cluster, 2.6” by 2.3” by 1.9” of utterly brilliant Himalayan quartz from the Kullu Valley in India. These crystals are so startlingly clear that they almost get lost in each other and interestingly, the smaller the crystal, the greater the clarity. There are two taller crystals and the rest are only less than 0.5” high, mixed with a fine druse of tiny mm-sized crystals and glitteringly gorgeous! Most of the tiny ones have sparse inclusions of lovely green chlorite and cover the rounded and golden healer stained quartzite matrix, giving it a sparkle and glitter as well! The entire cluster is in excellent condition and as heady energetically as he is handsome! Bright, huge and joyful – these are all totally descriptive of this Spirit. There is a very strong crown activation as you work with him – you immediately become aware of a vortex opening over your head and a huge surge of energy associated with this opening – like an energy beam heading straight out of your head. This is coupled with a deep sense of wisdom and knowing – not facts, but insight. It’s as if the complex suddenly becomes simple and obvious. He teaches that it is all here before our eyes as long as we are open and receptive. 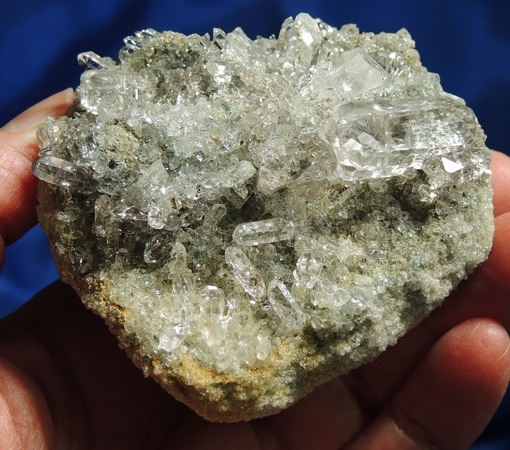 His chlorite is protective and grounding while his phantoms permit connection to the Inner Self … an area we typically hide away, even from our Self. We’re afraid that others will make fun or won’t understand and we’ll be “exposed” for revealing so much. This wonderful Spirit shows us that we can be fully expressive – in a world where most do not show it, we can smile because what you see is what you get … we become pretense-less and open. And what a joy that is!